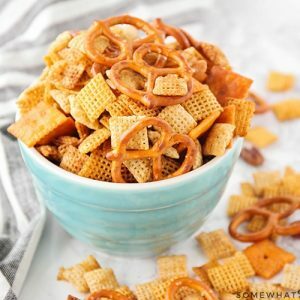 This Original Homemade Chex Mix Recipe Is So Quick And Easy To Make, And So Addictingly Delicious That You Won't Be Able To Stop Snacking On It! In a large microwave-safe bowl, mix together the corn Chex, rice Chex, mixed nuts, pretzels, and Cheez-It crackers. In a small microwave-safe bowl, melt the butter. Stir in the Worcestershire, seasoned salt, garlic powder, and onion powder. Pour the butter mixture over the cereal mixture and toss to coat. Microwave uncovered on high for 4-5 minutes, stirring every minute. Watch carefully to prevent burning. Spread on paper towels or parchment to cool, then store in an airtight container.